Squirrel repellent food is absolutely way to go approach to squirrel proofing your bird feeder and it's definitely worth of your attention if you want to divert squirrels from stealing bird food. Let me tell you some science behind it. 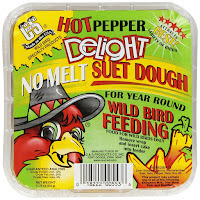 The very concept is based on a fact that the birds are able to eat extremely spicy, hot pepper blended food without noticing any difference comparing to regular bird seed (or any need to dial firefighters after the lunch). On the other side, the squirrels will hate hot food because they just can't stand the taste of it. This is because the birds don't have hot food receptors in their mouth, while the squirrels do. So, when a squirrel tastes even a smallest bit of this kind of food it will start acting like most of the people would do: it will start running around in circles feeling the heat rush to the ears and it will finally run away looking for the way to put out the fire... and never to come back. Of course, the squirrels don't get hurt permanently. They just learn they are not invited to the feast. What should one expect from squirrel proof bird food? Nowadays, the bird food production is highly competitive branch. Having in mind all the advanced methods and expertise used in the bird food production, I suggest we should not go for the second best when choosing top quality squirrel proof bird food with squirrel repellent properties. Birds must love the food. The food must attract various kind of birds over and over again meaning that all the nutritional needs of the birds must be satisfied using right choice of food ingredients. Squirrels must hate the food: the amount of repellent ingredient within the food must be carefully balanced to deter the squirrels but not to hurt them. All the food ingredients must be 100% natural. The repellent component must be 100% natural as well because the birds ingest it together with the food. The shape of the squirrel proof bird food must suit your feeder requirements: the food should be available either as squirrel proof bird seed for classic bird feeders, or in the form of squirrel proof suet in case you have suet bird feeder. Great reviews are more than welcome: if the positive feedback from previous customers is there to support the claim that this squirrel proofing method actually works, then it's definitely good anti-squirrel solution. If you are into preparing bird seed mixture according to your own recipe, you could try and add some cayenne pepper powder to it. It should work against the squirrels. Have fun with, do a couple of experiments and try to determine the right proportion of the pepper powder in the seeds. Still, most of the people people find using Cole's Flaming Seed Sauce more efficient than cayenne powder because the sauce is liquid and stays on the seeds as it dries out. Surprisingly enough, the sauce does not spoil the seeds and the seeds does not rot under the influence of the liquid from the sauce. 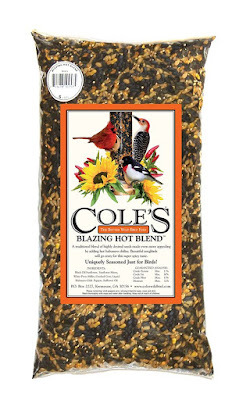 A bottle of 16 oz of Cole's Flaming Seed Sauce is enough for about 40 pounds of the bird seed (3 tablespoons per 5 pounds of the seed) and it seems like real good bargain to me.